card which can take a 32M daughterboard. Notes:          SPARCstation 2 without a monitor/framebuffer. 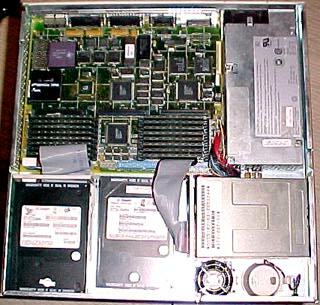 Here is the interior of the unit, where you can see the 3 bays (2 HD, 1 floppy), although in this shot, the second HD and floppy were removed. This machine has all the RAM banks filled with 4 Meg 30pin true parity SIMMs, so the total ram is 64Megabytes. No SBUS cards are currently installed. The large black square, on the far left side of the machine, is the CPU, in this case, a Weitek "Power-up", which turns the SS2 from a 40Mhz machine into an 80Mhz machine. In the front of the machine, you can see an extra fan and the plastic housing for the internal speaker. Here's the rear of this same unit, showing (from left to right): The Power switch and cord plug, the fan, the external SCSI connector, AUI Ethernet, Serial Port "A", Serial Port "B", Keyboard connector and Sound in/out connector. The three rectancular holes above the ports are where the connectors for Sbus cards would be. Normally, these are covered by metal shields (just like on a pc), but they were removed. And here's the machine again, with an extra HD and the floppy put in for placement purposes. I usually run my machines as empty as possible, to save wear & tear (why run a floppy I never use? ), and to keep these things running as cool as possible. If it's going to sit in a corner an act as a web server, then I take out anything not related to that purpose. That's just me. If this were a general purpose workstation, I'd have it loaded with cards and keep the floppy in there. 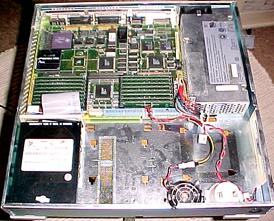 Anyhow, from this photo, you can see that the floppy sits, facing the right side of the unit, and you'll also note that, unlike a PC, ejection of the floppy is controlled via software and the floppy. It has a motorized ejection, so there's no external button to remove the floppy. You can eject from a command in the OS (SunOS, Solaris and Sparc Linux all have an "eject" command), and there's also an eject command from the ROM Monitor. The SparcStation 2 is still a darn good workstation, though a little slow when it comes to running graphics and being a "X" station. However, properly outfitted with upgrade chips (an 80Mhz version of it's CPU is available), enough ram, and a lightweight OS such as Linux (Solaris will creep on this machine), it's actually useable. It's equivalent in raw CPU speed to a 486 at 80Mhz to 100Mhz. However, total throughput is actually a bit higher - because for one thing, the CPU is really optimized to run UNIX, while an Intel processor isn't. Next, this box has SCSI, while most pc's have IDE, and SCSI is quite a bit faster. Plus, everything, including the enternet, is all integrated into the main board, so there's no "bus" problems (most 486's are ISA bus). So, actual overall performance is actually a little bit better than a 486 at 50Mhz. Not that this is going to go head to head with a Pentium III, but for acting as DNS, or light web hosting, or a small mail server, this is a fine box. Don't try and make it do everything, as many services eat RAM, and a high load will slow the thing down to a crawl. However, for a single use, lightweight server or low-end workstation, this will provide many years of trouble free service.